IN FRONT OF APROSOJA CUIABA BRAZIL OFFICE. THE PARTICIPANTS WERE FROM CANADA, USA, BRAZIL, PARAGUAY, FRANCE AND GERMANY. PHOTO COURTESY OF APROSOJA. The IOPD brings together representatives from oilseed farmer associations from many of the largest oilseed-producing countries, representing commodities including soybeans, canola, and rapeseed. Most of the countries are competitors on the world market, but still meet annually for an open dialogue session focusing on commonalities and issues facing the international industry. Many of the discussions focus on policy and regulations, market access, and the future of the oilseed industry. The 2018 conference was hosted by the Matto Grosso chapter of Aprosoja, the Matto Grosso Soybean and Corn Growers Association, and included farm and processing tours of Brazil’s soybean industry. Each year the dialogue changes, but the IOPD agenda is standard, giving every country an opportunity to present their perspective on their domestic oilseed industry. Haerle presented alongside Jack Froese, fellow Canadian delegate and president of the Canadian Canola Growers Association. Together, they outlined policy issues impacting Canadian oilseed farmers, including the changing trade climate, public trust, rail transportation, sustainability and the environment, business risk management, and innovations and investments in crop inputs. Haerle noted all countries and industry representatives mentioned trade disruptions and the market pressures that result from the unpredictable market climate in their respective presentations. The IOPD resolution process is another major agenda item for the event where resolutions from the previous event are reviewed, common issues discussed, new resolutions are made, and action items are assigned to the new resolutions. This year’s resolutions focused on sustainability and public trust, innovations for future generations, renewable energy and bio-based products, and trade. All resolutions are motivated by improving the international oilseed industry, trade, and market access. This year’s conference saw a proposal put forward by Brazil to change the current soybean grading standards from the current visual-type system to one that would be based on measurable oil content, protein content, and digestibility. 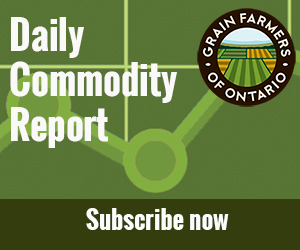 “The new grading standards proposed could be a game changer, significantly impacting how soybeans are traded and graded. And these could change how Canadian soybeans compete in the global market,” says Haerle, explaining that since growing climates impact the composition of soybeans, the proposed grading system may offer South American growers a competitive advantage. The new grading system proposal will be discussed further at future IOPD meetings, but Haerle notes this proposal could have global trade implications, and is one to watch. “Change could be on the horizon and if the grading proposal goes through, it could impact all oilseeds, not just soybeans,” warns Haerle. Research and plant breeding discussions also centered around policy and trade regulations. The infrastructure and transportation of commodities within oilseed producing countries has always been another matter competing countries keep close tabs on. For example, Brazil has been working to improve transportation from field production to processors and ports for exporting. “And if successful, Brazil could quickly become the biggest player on the global soybean market,” says Haerle, who also notes transportation could be a challenge for Canadian soybeans if soybean production increases in Western Canada. • U.S. Soybean Export Council (USSEC) — United States.